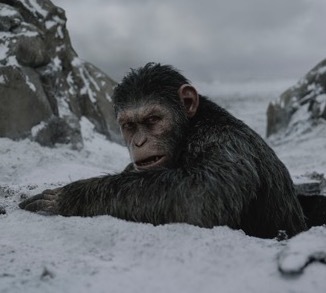 "Apes" arrival: Aging franchises have had a rough time at the summer boxoffice, but moviegoers hit the multiplexes last weekend to see "War for the Planet of the Apes," the latest in a series that goes back to 1968. The 20th Century Fox and Chernin Entertainment PG-13 rated sci-fi action adventure was the weekend's 400-pound gorilla with its $56.5 million opening at 4,022 theatres. About $5 million of that total came from Thursday night previews at 3,251 theatres. The franchise's last episode, "Dawn of the Planet of the Apes," opened July 11, 2014 to $72.6 million at 3,967 theatres. Directed by Matt Reeves ("Dawn of the Planet of the Apes"), "War" stars Toby Kebbell, Andy Serkis (as Caesar) and Judy Greer. "The film earned $46.044 million internationally this weekend for a combined global total of $102.5 million," comScore senior media analyst Paul Degarabedian said Sunday morning, calling it an "impressive $56.5 million debut amidst solid social media buzz and critical accolades." Hollywood handicappers had been estimating a domestic opening of between $55 million and $60 million and "War" met those expectations. Its 95 percent Certified fresh score on Rotten Tomatoes had encouraged positive projections. "War" also scored well on the movie info and ticket selling service Fandango's Fanticipation moviegoer poll with 89 percent, second only to "Spider-Man: Homecoming's" 90 percent. Fandango said "War" was "outselling last summer's 'Star Trek Beyond' and 2014's 'Dawn of the Planet of the Apes' at the same point in the Fandango sales cycle." 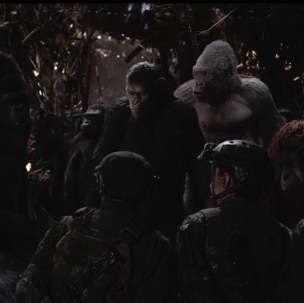 In its survey of over a thousand "War" moviegoers, Fandango found that: "87% are fans of Woody Harrelson; 86% want to see Andy Serkis (as Caesar) considered for an Oscar nomination; 83% have seen at least one of the previous 'Apes' movies on the big screen; and 67% are fans of director Matt Reeves' previous work (including 'Cloverfield')." "War," which reportedly cost about $150 million to produce, is the ninth episode in the franchise that's done about $647 million domestically since 1968 (a time with much lower ticket prices). It's the third episode since the franchise's 2011 reboot. "War" follows in the happy footsteps of Columbia Pictures, Marvel Studios and Pascal Pictures' PG-13 rated 3D sci-fi action adventure "Spider-Man: Homecoming," which finished a strong second in its second weekend with $45.2 million, down 61 percent. With a domestic cume of $208.3 million and an international cume of $261.1 million, Spidey's global total is now $469.4 million. 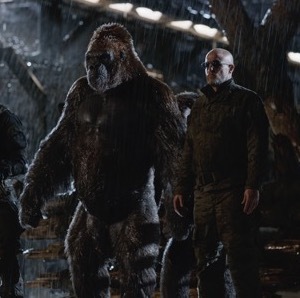 Clearly, "Apes" isn't suffering from the same franchise fatigue that earlier this summer infected such aging series as "Alien," "Transformers" and "Pirates of the Caribbean." (1) TITLE: "Planet of the Apes"
NOTES: "Apes" was to have been directed by J. Lee Thompson, who co-owned the movie rights with producer Arthur P. Jacobs. However, Thompson couldn't make the film because he was committed to directing the 1969 romantic action adventure "Mackenna's Gold." Blake Edwards was talked about to direct at one point, but Jacobs wound up picking Franklin J. Schaffner, who came recommended by Charlton Heston. Schaffner and Heston had previously worked together on the 1965 historical drama "The War Lord." Thompson did, however, wind up directing two later "Apes" episodes – "Conquest of the Planet of the Apes" (1972) and "Battle for the Planet of the Apes" (1973). In 1968, boxoffice grosses weren't reported on in detail as they are today, so some basic boxoffice details aren't available. "Apes" was the top grossing film for its first three weeks in theatres. It reportedly did $3.7 million for the week of Feb. 11, 1968; $3.4 million for the week of Feb. 18, 1968; and $3.2 million for the week of Feb. 25, 1968. (2) TITLE: "Beneath the Planet of the Apes"
NOTES: "Beneath" is the only one of the original five "Apes" episodes that doesn't star Roddy McDowall as a principal ape character. McDowall had scheduling conflicts, so David Watson played the ape character Cornelius that McDowall did in the first episode. "Beneath" topped the boxoffice chart for two weeks. It did $3.6 million for the week of May 31, 1970; and $3.1 million for the week of June 7, 1970. (3) TITLE: "Escape From the Planet of the Apes"
NOTES: "Escape" was number one at the boxoffice for the week of May 23, 1971 with $4.3 million. For the first "Apes" movie, it reportedly took four and a half hours to apply the principal ape characters' makeup. By the time "Escape" was made, the makeup artists were able to get the same job done in just three and a half hours. (4) TITLE: "Conquest of the Planet of the Apes"
NOTES: "Conquest" received a PG rating at the time for violence. The other four original "Apes" episodes were all G rated. "Conquest" is the only one of the five films without a pre-title sequence. Although one was filmed, it apparently was so violent that it would have resulted in an unwanted R rating. Roddy McDowall, who played the ape Cornelius in the original "Apes" and "Escape," plays Cornelius' son Caesar in "Conquest." (5) TITLE: "Battle for the Planet of the Apes"
NOTES: "Battle" was the top grossing film for the week of June 17, 1973 with $4.9 million. "Battle" was rated G, reflecting the studio's decision to broaden its appeal to family audiences by toning down the violence for which the previous episode, "Conquest," had been criticized. This episode ended the first "Apes" series. Fox then moved the project to television with a 1974 "Planet of the Apes" show with 14 episodes starring Roddy McDowall, Ron Harper and James Naughton. The series was set in 3085, about a thousand years after "Battle's" storyline. Eight additional episodes were written, but never produced. (6) TITLE: "Planet of the Apes"
NOTES: The rebooted "Apes" episode was the 10th biggest grossing film of 2001. Tim Burton spoke of this film as being a "re-imagination" rather than a "remake" of the 1968 original. Tim Roth, who stars as the ape General Thade, turned down the role of Professor Snape in "Harry Potter and the Sorcerer's Stone," in order to do "Apes." The role of Snape was cast instead with Alan Rickman, who went on to play it in seven additional "HP" episodes. (7) TITLE: "Rise of the Planet of the Apes"
NOTES: "Rise" was 2011's 11th top grossing film. Andy Serkis, who plays the ape leader Caesar, previously played an ape as the title character in Peter Jackson's 2005 remake of "King Kong." A number of other directors were reportedly talked about to helm "Rise" before Rupert Wyatt came on board, including (alphabetically): Tomas Alfredson, Kathryn Bigelow, Robert Rodriguez, Allen Hughes & Albert Hughes, Dennis Iliadis, James McTeigue, Pierre Morel and Scott Stewart. (8) TITLE: "Dawn of the Planet of the Apes"
NOTES: "Dawn" was the 11th biggest grossing film in 2014. "Dawn," the second episode in the franchise reboot, is to some extent a remake of the 1973 episode "Battle for the Planet of the Apes," which was the first series' fifth and final episode. Keri Russell, who plays "Dawn's" female lead Ellie, previously worked with Matt Reeves as the star of the hit TV series "Felicity." Reeves and J.J. Abrams created the show, which aired from 1998-2002. Bottom line: Last weekend's domestic ticket sales were about $165 million, per comScore, up about 1.1 percent vs. $163.3 million a year earlier when "The Secret Life of Pets" was number one in its second weekend with $50.8 million and a domestic cume of $203.4 million. Despite last weekend's decent debut for "War" and the slight boxoffice uptick it generated compared to this time last year, 2017 is continuing to erode vs. 2016. In fact, the 2017 lead that strong spring ticket sales had produced has now been entirely wiped out. The domestic boxoffice to date this year is $6.318 billion, per comScore, down 0.4 percent vs. $6.346 billion this time last year. Last week, 2017 was down 0.1 percent.